Examining their cast of second-season villains, slowly rising like malevolent bread dough in the cool September sun, and realizing that they haven’t done a bird guy in a while, the writers of Fox’s Batman prequel Gotham have sent an intern to dig another fowl fiend out of the copy of The Big Book Of Obscure Batman Baddies that they always keep on hand. Rooting through the tenebrous tome, said hapless college-credit seeker apparently managed to stumble onto one of the nastiest customers in the book, setting the stage for Flamingo to arrive in Gotham City. 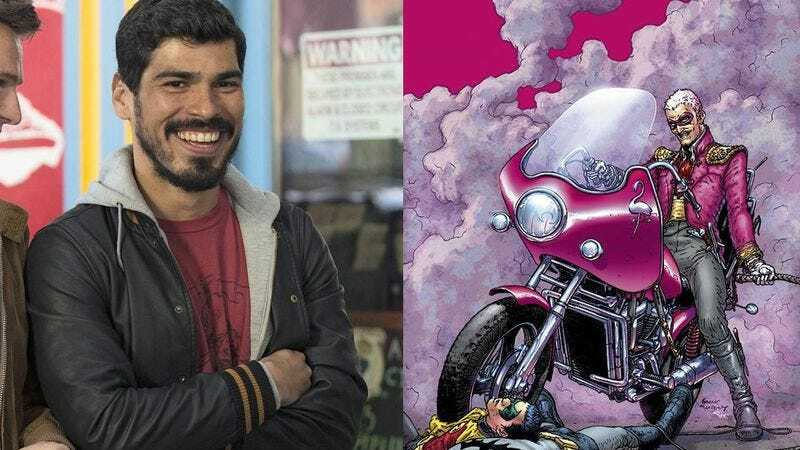 Played by Looking’s Raul Castillo, the Grant Morrison-created character might present the greatest challenge yet to Gotham’s carefully maintained aesthetic of slightly ridiculous boredom. A pink-clad, whip-wielding serial killer who poses like Prince and eats people’s faces, it’s going to be hard work to render Flamingo in Gotham’s signature dark-beige palette. But if anyone can do it, this is the team to pull it off, and we’re anxious to see it happen—if only because it might bring some of Morrison’s other villains into the fold, and not even Gotham could wring all the gleeful madness out of someone like Professor Pyg.